SALEM, Ore. (AP) — The exodus of gray whales heading south along the Oregon Coast is beginning. Each year, from Mid-December to Mid-January, around 20,000 whales swim from the cold Alaskan seas to the warm lagoons of Baja Mexico. (See bottom of story for a list of best locations, by the numbers). While much of the success in whale watching is patience — the willingness to keep your binoculars focused on the ocean — there are a few places and tips that can help improve odds, Parsons said. In winter, the whales are swimming a bit farther from shore. That makes the best locations those higher in elevation, where you can see farther out into the ocean. A few places with the highest success rates include Cape Meares (near Tillamook), Neahkahnie Mountain (Tillamook), The Inn at Spanish Head (Lincoln City), Cape Foulweather (Depoe Bay) and Shore Acres (Coos Bay). The second major factor in spotting whales is weather. A clear and sunny day morning with low winds is best, Parsons said. 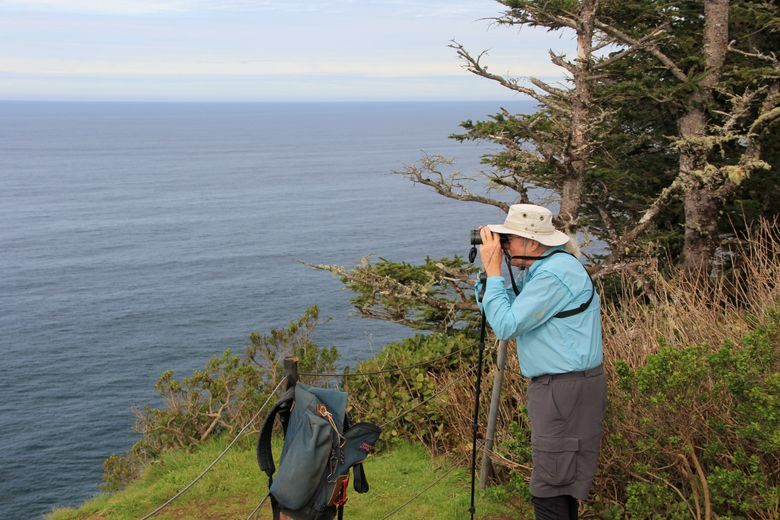 Best hike-in view spot: A combination of one of the Oregon Coast’s best hikes and whale-watching spots comes together at Cape Lookout State Park. A trek of 2.5 miles (5 miles round-trip) takes you to the point of the cape, where you can see landmarks 40 miles away and whales sometimes swim by quite close. The hike begins at Cape Lookout State Park’s main trailhead south of Tillamook. Close to Salem (warm): If you don’t want to look for whales in the sometimes chilly outdoor air, set up shop at the Inn at Spanish Head Lobby on the 10th floor. Coffee and snacks can be enjoyed while keeping your eyes peeled on the ocean. Close to Salem (cool/warm): Fresh air and whale watching takes place at Boiler Bay Scenic Viewpoint in Depoe Bay. Just step out of your car and look across the ocean. No luck? Continue just south to the Whale Watching Center in Depoe Bay, where experts can help guide your search. Each year, the Oregon Parks and Recreation Department keeps track of the number of whales spotted at each of the 24 locations where volunteers are located during Whale Watch Week. The results from Dec. 27-31 in 2015 can help visitors pick locations with the best chances for a sighting.